I've read your entire site, VERY helpful. I have 5-6 top rails that have rusted through, and need replaced. Unfortunately, the pool is too old to identify the manufacturer. I've searched the Asahi pool guys site in New York, and think they may have something that will work. 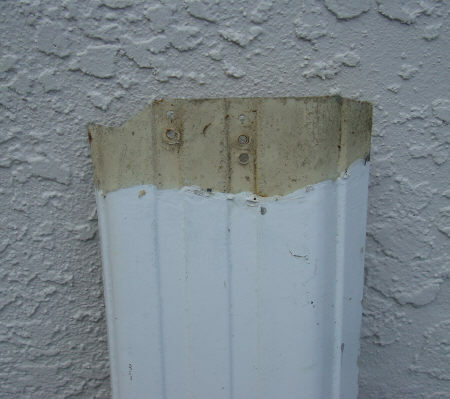 Do you know of any other sites, or companies in the gulf coast of Fl that offer replacements? I'd say they are 46.5" long 6" wide and have two small valleys running the length of the piece. I can send pics if needed. Hi Chris. Thanks for getting the photos to me. This pool is not an Asahi and it is not a Muskin, although it is very similar to one of the older Muskin models. I installed hundreds of these and the only name I remember seeing on the box was Hub. I think it was a product manufactured by Home and Roam Leisure Products but I can find no information on either name. The store that dealt with these pools was Pool Supply Warehouse in Phoenix. It has been so long ago they may not even remember them. I am posting your photos in hopes that someone can identify this pool, and maybe a source for parts. I have the same caps and can't find them...please let me know! It is probably an Ovation pool like mine. Out of business. If someone finds these rails or a replacement please email me at tlbeachhouse22@gmail.com. God bless America! I took down our Home and Roam pool several years ago, and saved the top rails that were not rusted. Contact me at cpa8711@aol.com, if interested in buying any. We have a 15 foot by 30 foot oval "the dove" 1997 Haydon manufacturer top rails are rusting. Any help? 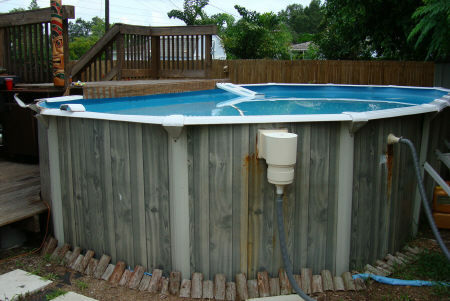 I've been looking for new top rails (6"x48")for an old(25-30Yr)Lomart 18' round pool. Cant find them anywhere? Can't afford to buy whole new pool just to replace top rails. I've refinished them every 2-4 years in past 12, but now rusted through. any suggestions? Where did you buy the rail tops from? I'm looking for 3 top rails for a Patriot Eldorado pool 24 foot round. The original paper work says they are 7" wide x 2 1/2" deep. Any one have any idea where I can locate these? I bought the pool in 1996. The company I bought it from said this pool was discontinued and they can't get parts for it. So much for my 25 year warranty! 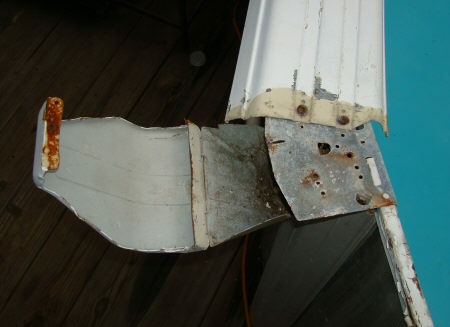 I've got rusted top rails with pieces dropping into the pool.. A cheap fix is to take rails off and brush grid with your drill and the spray a coat of the gutter liner in a can . It turns into a layer of rubber. You see it advertised on tv all the time. It will take about 6 cans. You can buy 2 cans for $20. Problem solved unless you want to shoot a coat of rust oleum paint on top of rail? I have a 15 year old El Dorado above ground and am looking for top rail caps.any suggestions? Try inyopools.com send them pictures. I sent them pictures of my pool top rails and they have them.